When I turned 16 I had been working for a little less than a year, but had managed to save enough money to purchase a new camera. I suppose most kids my age were saving for a car, but my priorities were clear. I was hired to shoot a seminar in the summer of 2000 and was asked to help select a camera to buy for the shoot. After it was complete, I was asked if I wanted to purchase the camera and I agreed - shelling out around $1200 for it (a slight discount, but still a big chunk of change for me at the time). What made the camera worth emptying my bank account for, was that it was digital. This was the beginning of editing on the computer, higher resolution and most importantly, more options. Having a digital camera and a decent family computer meant that for the first time I could add music, titles, and transitions to my work. I could actually edit with some accuracy! It's something that now seems so easy, but at the time it was a rush - and truthfully, my evolution in using the computer was slow going. Through most of high school and into my first few years of university this was my camera of choice. I opted to use it on my productions in early film school courses because it seemed just as good as what they'd let us use. The digital quality of this camera was at the top of the spectrum for what was available in the consumer market at the time, and to be honest, it's still a great little camera! I've made a lot of videos with this Sony - including Keys to Existence which has screened at several international festivals and venues. The DCR-TRV110 proved to be versatile enough to allow me to experiment and learn a lot of the basics of media production when I was really hungry to learn. For more just check My Videography for projects between 2000-2005. In late 2005 I knew it was time for an upgrade mainly because of how much I was using MiniDV in my production classes. Without a doubt, I got my money's worth from this camera though. 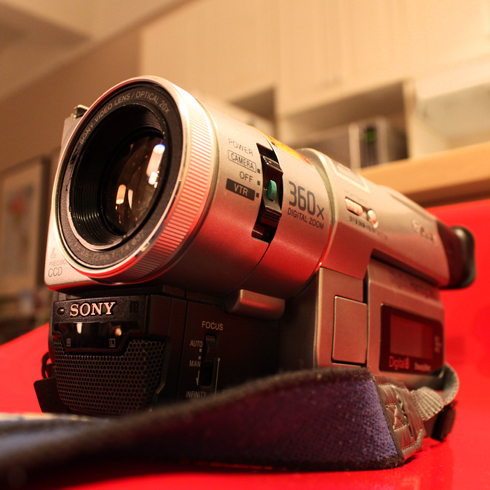 These days, my D8 is used mainly to access old footage, but on occasion I've still used it for home video shooting. Given my personal history, this is one camera I'll never get rid of.